The U.T.C.W.I. 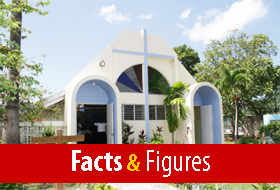 has been described as “the most significant venture in Caribbean ecumenism to date”. 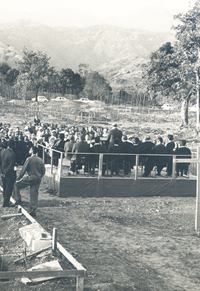 The matrix of the College goes back much further than the date of its dedication on Wednesday, April 27, 1966. 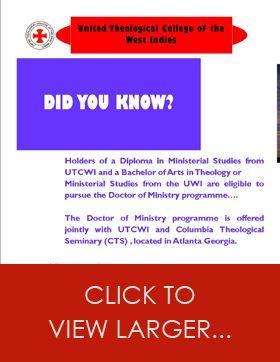 Indeed, the Caribbean has not only had a long history of Theological education and ministerial training, but also an almost equally long one in ecumenical and co-operative ventures in preparing candidates for the ordained ministry. In 1954, the Theological Education Fund of the World Council of Churches took two important decisions. Firstly, that Theological Education was to be seen as a developmental tool for the integration of the region. Secondly, that this integration had to be attempted on a co-operative basis. Many problems were faced for which solutions were not always easily found. The Methodists, Presbyterians (Jamaica), Moravians, Congregationalists and Disciples of Christ had already come together to form the Union Theological Seminary. So for them, the problem was largely that of financing the new venture. The Baptists, while sharing teaching programmes with the above had their own College, Calabar, whose buildings were relatively new, having been built in the early 50’s. St. Peter’s College was founded in 1877 for the training of Anglican Priests; and this it continued to do throughout the years. The Anglican students did all their training at their College, taught only by their tutors. The present site was purchased with a grant of 33,500 Pounds from the Theological Education Fund. This was subject to the provision that “if the land is not used for the building up of facilities of theological training the title shall revert to the T.E.F.”. This condition was to hold good for 21 years. The buildings were made to house 110 students and provision was made for 9 staff houses. Denominations contributed 1,600 Pounds for each student place requested. The Churches which participated in the formation of the College were, The Anglican Church, Jamaica Diocese, The Disciples of Christ in Jamaica, The Evangelical Lutheran Church in Guyana, The Guyana Presbyterian Church, The Jamaica Baptist Union, The Methodist Church in the Caribbean and the Americas, The Moravian Church, East West Indies Province, The Moravian Church, Jamaica Province, The Presbyterian Church of Trinidad and Grenada and The United Church of Jamaica and the Cayman Islands. From the very beginning, the College entered a working relationship with the University of the West Indies and was established as the Department of Theology in the Faculty of Arts and General Studies (now Arts and Education). Since its inception, over 900 Christian leaders, trained by the institution, have received a greater understanding of the beliefs, worship and traditions of the various denominations. Academically, the graduates have excelled not only in the Caribbean but also abroad. There are graduates who are faithfully fulfilling their roles as Pastors, Priests, Deaconesses and lay persons throughout the region and beyond.